The Mac's desktop tends to collect files and folders at a prodigious rate, resulting in a messy desktop. 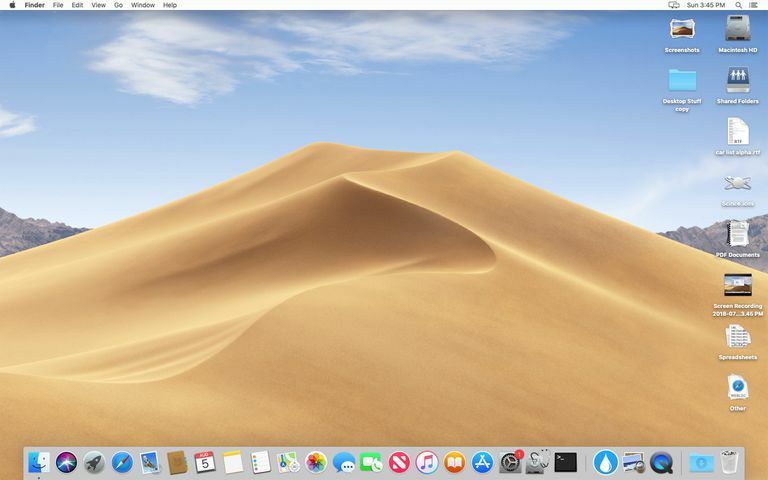 Desktop Stacks a feature introduced with macOS Mojave can organize, declutter, and improve your workflow. Now, Stacks is not a new feature; they have been around since the OS X Leopard added them as a way to organize multiple files into a single Dock icon. With Dock Stacks, you could create Stacks containing recent applications, documents, images, just about whatever you wanted. Desktop Stacks take the idea of the Dock Stacks as an organizing tool and apply it to all the files on your desktop. Rounding up all of the clutter on your desktop and placing them into multiple Stacks each containing related files. Desktop Stacks like their Dock Stacks counterparts can be opened to display their content, allowing you to work on the files within. The organization method, or how the files are grouped can be set to meet your needs. Click or tap once on the desktop to select it and bring it to the front. From the menu bar select View, Use Stacks. A checkmark will be added to the Use Stacks menu item to indicate that Stacks are turned on. You can also perform the same tasks by right-clicking on the desktop and selecting Use Stacks from the popup menu. Stacks can be turned off by selecting the Use Stacks menu item a second time, resulting in the checkmark being removed and all the files in the Stacks being dispersed to the desktop. With Stacks turned on, all of the files on your desktop will be sorted into multiple Stacks organized by file type. All the image files will be in one Stack, movies in another, PDFs in a third, and spreadsheets in a fourth. This is the default sorting method of Kind. You can choose from multiple sorting methods. Click or tap on the desktop once to ensure the desktop is the front most item. From the View menu, select Group Stacks By. Select the way you wish to group the Stacks by. You can also perform the same task by right-clicking on the desktop and selecting Group Stacks By. Once you make your selection the Stacks on the desktop will be resorted by the grouping you selected. Stacks are placed along the far right edge of the desktop and appear as a group of file icons stack one atop the other. Click or tap once on a Stack. The Stack will open and display all of the enclosed files. The files that make up the Stack may push other desktop items temporarily into new positions on the desktop. Those items will return to their normal location once you close the stack. Items in the Stack can be manipulated just like any other file, double-clicking or tapping will open the file in its default app. Clicking or tapping once on a file, then pressing the spacebar will let you Quick Look the file. You can use the Finder to copy, delete, move any of the files within a Stack. Be aware if you move a file from a Stack to the desktop, it will be sorted back within a Stack as long as the Use Stacks view option is enabled. Open Stacks have a downward facing chevron icon. Click or tap the chevron to close the Stack, causing all of the files that are part of the Stack to be swept back inside the Stack. Stacks let you instantly clean up a messy desktop, but it does impose a bit of discipline on the user. With desktop Stacks enabled, a rigid grid is used for where files and folders can be placed on the desktop. For the most part, you won't be able to move desktop items around while Stacks are in use. How Do You Declutter the Auto-Complete List in MacOS Mail?